Three members of Boy Scout Troop 39 recently achieved Scouting's highest honor Sunday -- the rank of Eagle. 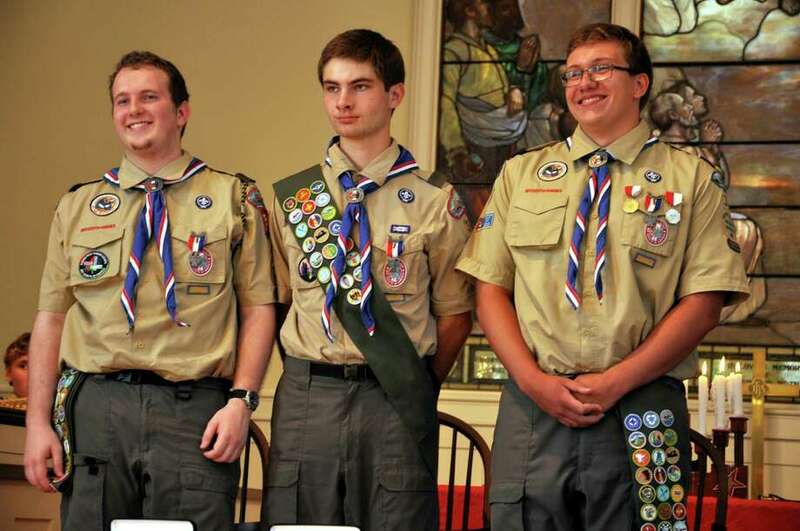 Ryan Fanning, Joshua Lindsey-Noble and William Overton were presented with their Eagle badges during a ceremony at Greens Farms Congregational Church, capping an arduous regimen that in 2013 was completed by just 6 percent of Boy Scouts nationally. Eagle is the highest of six ranks in Scouting. It requires earning 21 merit badges, including a dozen required badges; serving at least six months in a Scouting leadership position; completing a service project for a religious organization, school or community, and passing muster with a review board. Fanning, Lindsey-Noble and Overton all are Staples High School students, and all joined the Boy Scouts as fifth-graders. Two of their service projects benefited Greens Farms Congregational Church, and the third provided food for the needy. Fanning, who lived in Portland, Ore., before moving with his family to Westport last year, organized the donation and collection of more than 1,000 pounds of nonperishable food for a Portland program that feeds the needy. His project benefited Potluck in the Park, which serves 500 to 700 meals in a downtown park each Sunday, the troop said in a news release. Lindsey-Noble, a musician and member of the Greens Farms Congregational choir, led a project to catalog and preserve the church's music archive. The idea for his project stemmed from the 2011 fire that extensively damaged Saugatuck Congregational Church, the troop said. Overton's project was inspired by the church's 300th anniversary in 2011, the troop said. He organized and led a team of volunteers that cleaned, reset and restored gravestones in the church's historic cemetery.